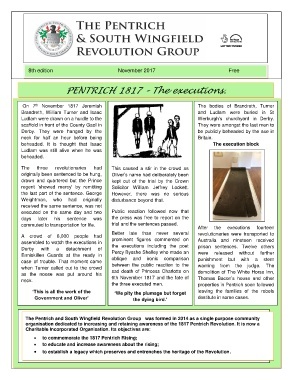 PENTRICH 1817 – The executions. Ludlam were drawn on a hurdle to the                                    Werburgh’s  churchyard  in  Derby. neck  for  half  an  hour  before  being                                Britain. regent  ‘showed  mercy’  by  remitting   Solicitor  William  Jeffrey  Lockett. Weightman,   who    had   originally   disturbance beyond that. commuted to transportation for life. trial and the sentences passed. Government and Oliver’          Forthcoming events                   destitute in some cases.